Hope everyone has had a Happy Passover and Easter! Here are the latest social media and technology updates worth knowing about. 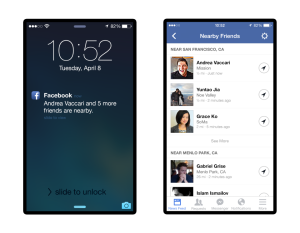 Facebook Adds “Nearby Friends” Feature to Mobile App: Facebook has expanded their location check-in feature to allow users to locate friends nearby in real time. While this will help users connect in person, users should be wary as this feature will also be used for targeted ads. Users concerned about privacy needn’t worry as the feature is only available when manually activated within the Facebook app. Americans Anticipate Tech Advancements will Create Positive Impact: The Pew Research Center recently conducted a study meant to measure Americans’ attitudes on the future of technology. According to the study, that 59% believe the technological advancements of the next 50 years will benefit society. 30% believe these very changes will leave us worse off; their concerns include technological advancements that lead to increased surveillance and to replace human caregivers for the aged and infirm.